Annual Gala Raises More Than $1 Million for Fourth Consecutive Year, Totals Over $7 Million for CMN Hospitals in Thirteen Years. Kevin Irving, sickle cell disease patient and guest of honor, shares his sickle cell disease story. Organizers of the thirteenth annual California and Nevada Credit Unions for Kids Wine Auction have announced that the gala event raised $1.3 million for the eleven Children’s Miracle Network Hospitals in California and Nevada. This is the fourth consecutive year that the event has raised over $1 million for these hospitals. The California and Nevada Credit Unions for Kids Wine Auction is the largest single fundraising event for Credit Unions for Kids, having raised more than $7 million since 2006 for Children’s Miracle Network Hospitals. The sold-out event which took place earlier this month at the Ritz-Carlton Laguna Niguel in Dana Point, California, drew 475 attendees and was supported by 83 credit unions, business partners and hospitals. The event’s theme “La Dolce Vita (The Sweet Life),” set the backdrop for an evening that included fine food, dancing, and both silent and live auctions. Attendees had the opportunity to bid on more than 600 packages that included bottles of fine wine, premium whiskeys, travel getaways, and concerts. The event’s very special guest was 20 year old Kevin Irving, a CMN Hospital patient at UCSF Benioff Children’s Hospital Oakland. 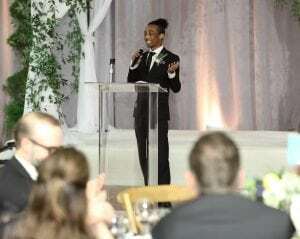 Kevin’s strength and courage inspired attendees as he shared how his journey with sickle cell disease and his experience at the hospital have changed his life. However, Kevin’s battle has given him a high threshold for pain, which allows him to be fearless on his skateboard and BMX bike. These hobbies, coupled with his passion for cars, help take his mind off of his disease. Kevin says, he doesn’t allow sickle cell disease to hinder his everyday life or use it as an excuse for being inactive. “Sickle cell isn’t a wall for me, but a motivation,” he explains. Pledges totaling $50,000 were made in support of a performance by Joan & Her Jets, starring Joan Opp, CEO of Stanford Credit Union, singing “Daddy’s Hands,” with back-up singers Erin Mendez, CEO of Patelco Credit Union; Diana Dykstra, CEO of California & Nevada Credit Union Leagues; and Teresa Freeborn, CEO of Xceed Financial Credit Union; and arranged by their producer, Wally Murray, CEO of Greater Nevada Credit Union. The lead Corporate Sponsors of this year’s event were CU Direct, the California and Nevada Credit Union Leagues, CO-OP Financial Services, and CUNA Mutual Group. As a result of the efforts and contributions of each of these organizations, as well as the event’s other sponsors, 100% of the money raised will directly benefit the eleven Children’s Miracle Network Hospitals in California and Nevada.